Monet began his wonderful series of paintings of the Paris railway-station Gare Sainte-Lazare in 1876, and completed it in 1878. He had previously painted variations on a single theme but this was his first systematic effort to ring the changes of light and time of day on a chosen subject. At least four of about ten paintings were executed at about the same spot under the large angle of the station roof, others in the open outside. He was interested in the diverse colours of steam, at one time deep blue against warm sunlight as in this instance or at another light against dark, and of course also in all the associated contrasts between the covered space and the city beyond. The way in which he used thick paint, blending numerous small bright touches of colour, was especially forceful in accordance with the suggestion of mechanical power the subject demanded. It is possible that some memory of Turner's Rain, Steam and Speed, which he had seen in the National Gallery in London six years earlier, crossed his mind and suggested the subject. So far did he become absorbed in what he painted that the spectator experiences all the sensation of being actually on the spot. Yet the fact that he could paint so many versions does not indicate a special interest in locomotives and steal power but rather in the changing effects of light in terms of colour that make each version so different from the others. This was the beginning of the several series of paintings - overall a remarkable contribution to modern art, which included separate series on Rouen Cathedral west facade, Hay Stacks, Water Lilies - in which the subject matter became of decreasing importance and light/colour became their raison d'etre. 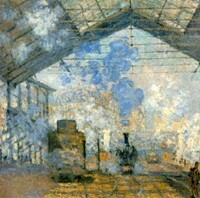 St-Lazare station was the Paris railway terminus which served what might now be called "Monet country". It was the station not only for Argenteuil but also for most of Monet's favourite locations in northern France, including Le Havre, Chatou, Bougival, Louveciennes, Ville d'Avray, Bouen and Vernon (for the branch line to Giverny). The subject had an obvious fascination for a painter with his interests, and the fact that he made twelve paintings in such a short time is a testament to his enthusiasm. Another reason for his haste was that he wanted to include the paintings in the Fourth Impressionist Exhibition and the closing date was in April. In the event he exhibited only eight of the twelve. Once he had completed the group he seems to have been creatively exhausted, and only produced four other paintings that year. See: Impressionist Exhibitions in Paris (1874-86) for more details about the early shows. Overall it is a carefully constructed composition which avoids too much symmetricality by simple devices of balance and placing. Although the canopy is exactly central (reflecting Monet's painting position), the engine is a little to the left, and the bulky shape of the carriage and the direction of the smoke from the engine continue the emphasis on the left side of the painting. The framework of the side of the shed extends this further, while the right side is left open, filled with light sharpened by the small dabs of sharp colour suggesting figures and objects. The general warmth of colour is emphasized by the floating areas of steam and smoke in white and cobalt violet tints - at once exciting and surprising. As Monet's painting developed it became increasingly high in key until the time of the later water garden series, when the deep blues and greens returned, used with an even greater mastery. The painting that christened the greatest art movement. Rapid plein air painting of the artist's wife and Mrs Eugene Boudin. Masterly rendition of summer walk among poppies. Monet created over 250 landscapes of his ponds and gardens at Giverny. One of 18 views of Monet's Japanese-style footbridge. NOTE: For the story behind French Impressionism and the group of artists who created it, please see our 10-part series, beginning: Impressionism: Origins, Influences. We gratefully acknowledge the use of material from MONET (2002) by Trewin Copplestone, an essential source for anyone interested in Claude Monet and the Impressionist movement.  For the meaning of other works of Impressionism, see: Homepage.